Model homes at SL70 are now available for viewing, and the first homes will be ready for occupancy this fall. Prices range from $599,000 to $689,000 – making these homes some of the most affordable in the Silver Lake/Echo Park area. In addition, the builder is offering "First release" closing cost credits of up to $6,000. Being one of the first to buy into a new development gives you the opportunity to pick your favorite unit and even your finishes before the property is completed. A word of caution - Don't Go ALONE! Be sure to take your own agent with you the first time you visit the site. If your agent does not register you the first time you go to the property, you will have NO representation! Remember – the builder's agent is there to get the best price and terms for the builder. Most developer contracts specifically state that they represent the seller and not you! Don’t go without your own agent who will represent you – to make sure you get the best possible price and terms from the builder. If you don't already have an agent, call us at 213-215-4758 and we'll go with you for that first look. Where Are These Homes Being Built? 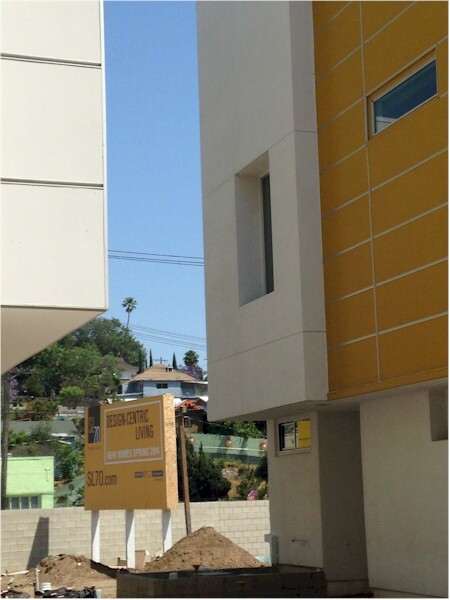 The jury is out as to whether these homes are truly in Silver Lake and not in Echo Park. You can see from the photo below that they are located near the end of the 2 freeway on Glendale Blvd. If you can buy one of the first phase homes, you'll be farther from the freeway and the final phase (to be built across the street on the other side of the fence) will help block the view and sound from freeway traffic. 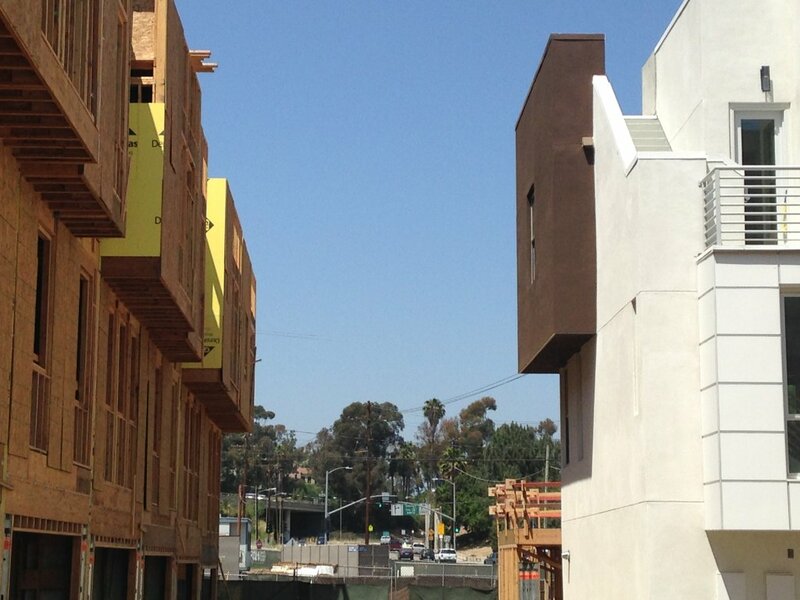 Located on Glendale Boulevard just south of the 2 Freeway, these 70 homes are being built under Los Angeles’ Small Lot Subdivision Ordinance. This ordinance removes the requirement for lot setbacks and allows for a lot size as small as 600 square feet. Other small lot ordinance projects completed around the area include Silver Lake’s Auburn7, Buzz Court on Rowena, and Heyday’s recently completed Peak Place development in Glassell Park. 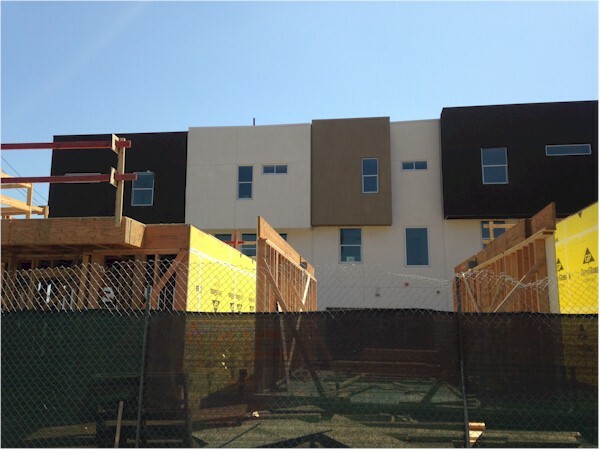 The development boasts 3-story homes ranging in size from 1,219 to 1,469 sf. Each has 2 or more bedrooms and 2 ½ baths. In addition, some have rooftop patios, and every unit has two garaged parking spaces. You’d be hard pressed to find new homes anywhere else in the area in this price range. Since small lot homes are structurally independent homes, you'll own both the house and the land, as opposed to just air space and a common area as you would for a condominium. Though there is generally a small monthly fee associated with common area upkeep, you won’t be faced with heavy and frequently rising HOA fees or condo association dues. And, since this is not a condominium development, you'll never need to worry about whether or not it is on the FHA approved list. That means financing will be easier now – and when it comes time to re-sell. The Silver Lake SL 70 small lot subdivision: It's new, it's hip, it's sleek, it's affordable … and if you enjoy the diversity and excitement of urban living, take at the developer's virtual tour. Would you like to take a look at these homes and get first choice plus pre-completion bonuses? There's no better time than right now. Call us at 213-215-4758 and let's go!